Mattress was fantastic as were the block out curtains allowing for jet lag rest. Location was very convenient. Staff held our bags for us while we explored the CBD after check out. Position - easy walk to the casino and streets either side with teams with easy access to everywhere. Bed very comfortable and large room. Double bedroom apartment was fairly large compared to a lot of other apartments in Melbourne CBD. Added bonus of having a kitchenette with cooktop. Location is quiet for Melbourne CBD but still well positioned and close to many attractions. Great location and good sized room with functional kitchen. The staff were friendly and helpful. The bed was very comfortable. Room was neat and tidy. Kitchenette with microwave and bar fridge was handy. Pool and Gym facilities were great. Really enjoyed our stay and would recommend. The room set up was very nice and the bed was extremely comfortable . Lock in a great price for Oaks On Market – rated 8.7 by recent guests! Oaks On Market This rating is a reflection of how the property compares to the industry standard when it comes to price, facilities and services available. It's based on a self-evaluation by the property. Use this rating to help choose your stay! 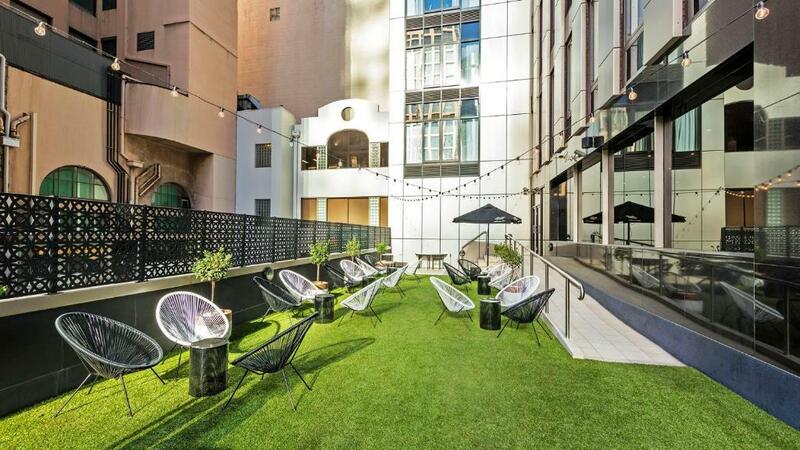 One of our top picks in Melbourne.Located in the heart of Melbourne CBD, just off Collins Street, Oaks on Market offers accommodations with kitchenette facilities and 32-inch flat-screen cable TVs. The hotel features a swimming pool, a hot tub and a sauna. Guests receive 30-minutes free Wi-Fi per day, per room. All apartments are air conditioned, and come with a CD player. Each has ironing facilities, a microwave and a refrigerator. Some also offer views of the Yarra River. Melbourne Oaks Hotel offers meeting and conference facilities. Guests can exercise in the well-equipped fitness center. Dry cleaning and laundry services are also available. The refurbished venue Oak & Vine Bar & Restaurant, pays tribute to Victoria's produce growers and suppliers. Enjoy a selection of wines from the states best wineries, as well as craft beers and weekly cocktail creations. The nearest tram stop is just a 1-minute walk from the hotel. Flinders St. Station and the Australian Center for the Moving Image are 10 minutes’ walk away. 뀐 Located in the real heart of Melbourne, this property has an excellent location score of 9.1! When would you like to stay at Oaks On Market? This spacious apartment features a kitchenette and a separate living area with a 32-inch LCD TV. This studio features a well-equipped kitchenette and a seating area with a 32-inch LCD TV. These modern studios are on levels 15 or above, with views of the city skyline. On levels 15 and above, with views of the city skyline. These modern apartments have a spacious living area which is separate from the bedroom. On levels 15 and above, with views of the city skyline. These modern apartments have a spacious living area which is separate from the bedrooms. Please note that the price is based on 4 guests using the existing beds only. Extra charges apply for additional people (see Hotel Policies). This apartment has a kitchenware, cable TV and air conditioning. This apartment features a sofa, seating area and CD player. This apartment features a dining area, air conditioning and electric kettle. This apartment has a tumble dryer, dishwasher and toaster. This well-appointed, modern apartment features kitchenette facilities, plus a spacious open-plan living concept are also included. Located on the top four floors of the hotel, take in the amazing views from the comfort of your apartment. Other features of the room include two complimentary drinks at Oak & Vine per stay, two bathrobes, two bottles of water per stay, breakfast for up to two guests per night and in-room WiFi. Guests will also receive a welcome pack per stay which includes an Oaks branded carry bag, Oaks notepad, Oaks pen, T2 Melbourne Breakfast Tea, T2 Sleep Tight Tea, Cadbury Chocolate Bar, Byron Bay Cookies, Oaks branded candy, Premium Pillow Menu and 25% discount voucher for F&B outlet. This well-appointed, modern apartment features a kitchenette with a full-sized fridge, spacious living area, dining area, and separate bedroom. Other features of the room include two complimentary drinks at Oak & Vine per stay, two bathrobes, two bottles of water per stay, breakfast for up to two guests per night and in-room WiFi. This spacious and well-appointed 2 Bedroom Premium Apartment includes kitchenette facilities with a full-sized fridge, a spacious living and dining room, and two separate, generously sized bedrooms. Other features of the room include four complimentary drinks at Oak & Vine per stay, four bathrobes, four bottles of water per stay, breakfast for up to four guests per night and in-room WiFi. For travellers seeking central, contemporary, self-contained accommodation, Oaks on Market in Melbourne’s lively city promises this and more – suited to guests travelling for business and conferencing or those simply wanting to explore Melbourne’s eclectic culture at leisure. House Rules Oaks On Market takes special requests – add in the next step! A AUD1 damage deposit is required on arrival (around USD0.72). This deposit will be fully refunded 14 days after check-out, as long as there isn't any damage to the property. Oaks On Market accepts these cards and reserves the right to temporarily hold an amount prior to arrival. Please note that there is a nonrefundable 1.5% charge when you pay with a credit card. Please note that the credit card presented on check-in must be in the same name as the guest on the booking confirmation. A damage deposit of AUD 1 is required on arrival. That's about 0.72USD. This will be collected by credit card. You should be reimbursed within 14 days of check-out. Your deposit will be refunded in full by credit card, subject to an inspection of the property. I know we didn’t have any housekeeping but we could have been given clean towels every day or at least every second day, especially as my son who was also staying at the oaks in another room at the same time had full housekeeping for a cheaper room rate than we did. Reception was hopeless at checkin. Staff especially. So friendly and helpful. Nice size room and great location. The apartment was bigger than I expected and very comfortable. The kitchen facilities make it easy to supply your own breakfast . There's nothing I don't like. Staff are always friendly. Rooms are immaculate. Despite making a call and speaking to someone in reception regarding payment, I was still debited twice for my stay - considering it was for 3 nights, this was quite a sum of money. It then took 3 days to have this refunded to my card - and it seemed quite unimportant to reception staff. I was given an upgrade - presumably for the inconvenience. I would have liked to have seen the room I booked to be able to compare - as the upgrade appeared to be the same room in description and size as the one I had originally booked. Rang hotel to discuss parking and was told car park was near by - NOT given instruction that it was on the next block. So I parked in the car park next door, as I am sure most people do. Upon check-in I informed staff where i had parked and in a somewhat flippant tone was told it is up to me if I choose to stay there, but the Oaks car park is down the road. So after a long day and having unpacked my bags etc had to leave my friend and all the baggage in reception while I rushed to move my car. My friend couldn't check-in as the booking was in my name and I still needed to sort the payment issue and I had to run off to move my car to ensure I didn't get charged for parking in the wrong car park, despite having called previously - not a great start to the stay. 2 Shower heads - no instructions how to transfer them from one small handheld to one large over the bath No Free bottled water in the room. The parking validation didnt work as expected. Location was great and the room was a great size. Nothing will stay there everytime. The staff the view and most of all the room and the service. Awesome location with brilliant staff. Apartments are a little dated. Could smell cigarette smoke coming in through vent ib bathroom.